It’s National Tea Week from the 14th – 20th August and the sound of cups clinking on saucers and the tinkle of pastry forks is likely to resonate through many a hotel. Afternoon Tea is one of those posh traditions which was introduced to the country by Anna, the seventh Duchess of Bedford in 1840. Anna found, quite reasonably in my view, that since dinner in her household wasn’t served until the fashionably late hour of 8 pm, she needed something to keep her going around 4. Given our hectic lifestyles and the constant struggle to keep up with friends and family, afternoon tea is a great way of spending an hour or so in their company whilst eating beautifully prepared sandwiches and cakes. What’s not to like? 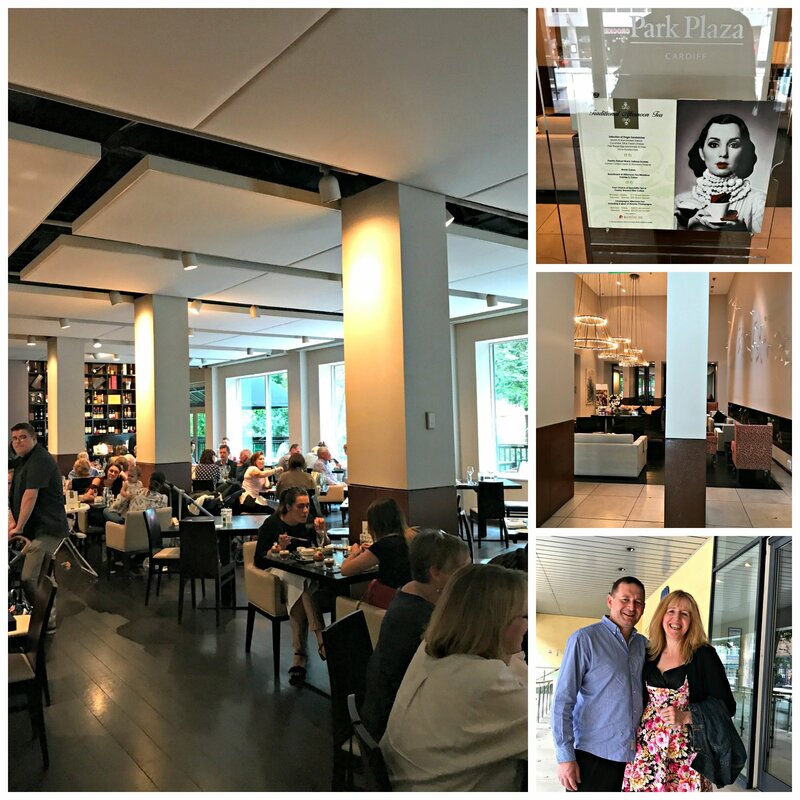 And the afternoon tea has been updated and made even more indulgent by the Park Plaza Hotel in Cardiff by the offering of the Hendrick’s Gin Afternoon Tea. Gin lovers will know that Hendrick’s is a distilled Scottish gin infused with rose and cucumber, as well as flowers, roots, botanicals and seeds from the world over. It has a uniquely refreshing taste and the folk at Hendrick’s seem to revel in oddness and the unusual. 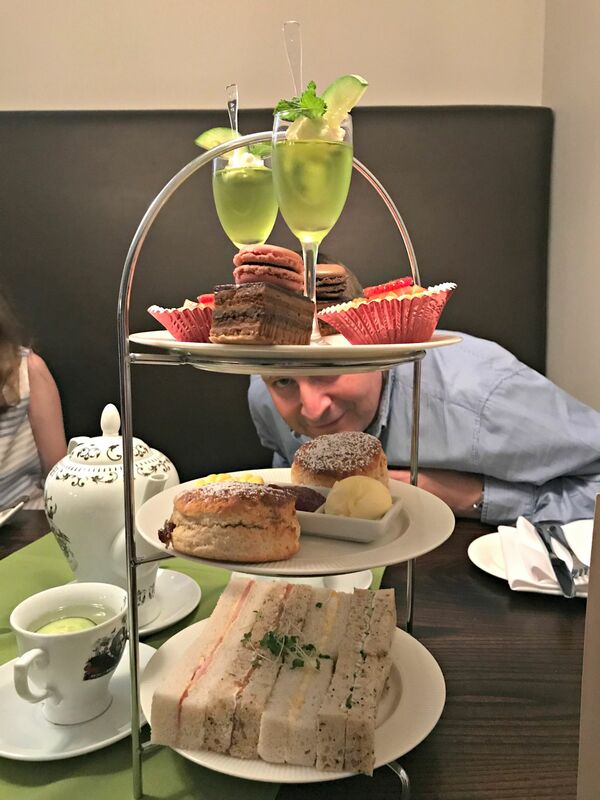 It’s totally fitting that a special afternoon tea should have been devised in its honour and one Sunday, the Husband and I went to test it to see if we could be converted to a tea with not a shred of caffeine (save in the gooey, chocolatey, coffee cake). I always like walking into gleaming Park Plaza reception. It’s usually calm but today the restaurant was absolutely buzzing. We were ushered into one of the booths in the Laguna Bar where we were greeted by the very affable and incredibly helpful George. I should mention at this point that, it being the school summer holiday, Caitlin and Ieuan were with us and on strict instructions to be on their best behaviour. (No we didn’t give them gin). George explained that our ‘tea’ would be the Hendrick’s Elderflower Collins, served in an elegant Hendrick’s teapot and cups and saucers. The cocktail – tea is made from Hendrick’s Gin, St Germain elderflower liqueur, Maraschino liqueur, Lemon juice & soda served with sliced cucumber. The flavour is light and elegant with the delicate perfume of the elderflower which nicely balances the cucumber flavour of Hendrick’s gin. It didn’t have a strong alcoholic ‘hit’ but it certainly revived us. You can order the more usual tea beverage is you prefer and there is a selection of teas, both traditional and herbal, and coffee to choose from. The food is served on a gleaming cake stand topped with two miniature lime jellies. It’s quite a show stopper – quite enough to stop the kids in their tracks and start demanding a swop for a chicken goujon (no deal!). A selection of finger sandwiches (Severn & Wye Smoked Salmon, Cucumber, Dill & Cream Cheese, Free Range Egg Mayonnaise & Cress, Home Roasted Ham. George gave us his helpful suggestion to follow the sandwiches with the jelly as a palette cleanser and then return to the scones, French Macaroons and Chocolate Opera gateau, ending lastly with the strawberry tarts. Everything was light and fresh – from the variety of breads used in the sandwiches to the subtle taste of the lime jelly. The scones, dusted with icing sugar were warmed and light as air without the often present cloying ‘baking soda’ taste which sometimes coats your teeth. (I’ve eaten a fair few scones in my time – it’s my Cornish ancestry). The Chocolate Opera Gateaux were squares of moist chocolate and coffee topped with a macaroon. The coffee taste was dark and strong which contrasted nicely with the sweetness of the macaroon. Lastly the strawberry tartlets were light as air with a delicate champagne flavoured cream. 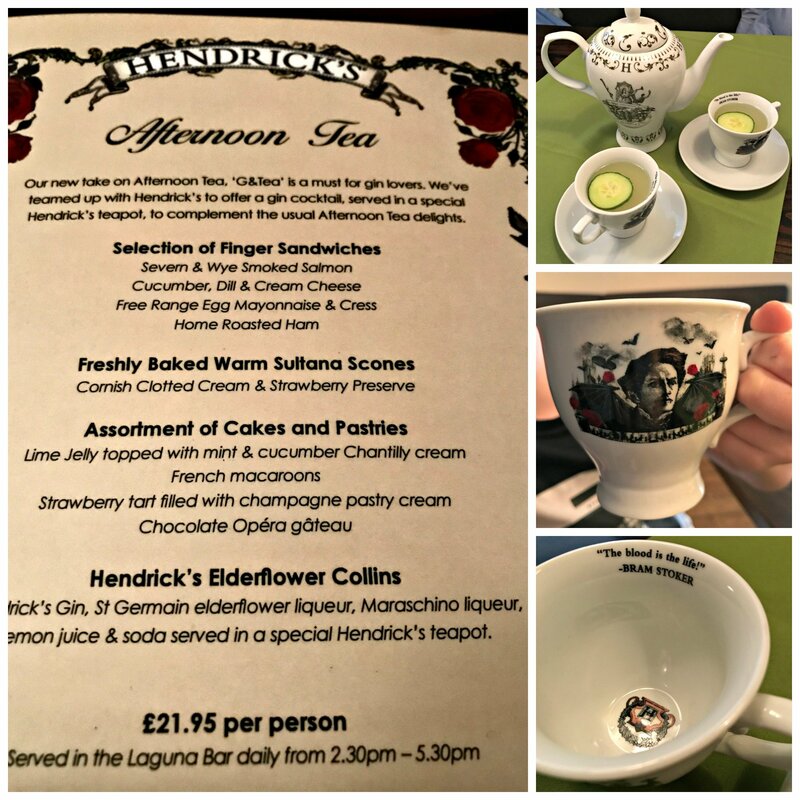 All of the food complimented the Hendrick’s ‘tea’. I must admit that when I saw the cake stand arrive I wondered if we would be able to eat it all but, as afternoon teas go, the Duchess of Bedford would have been very happy with this one. Personally I fancy a Laguna Hot Stone Back Massage and an Elemis Superfood Pre-Radiance facial. 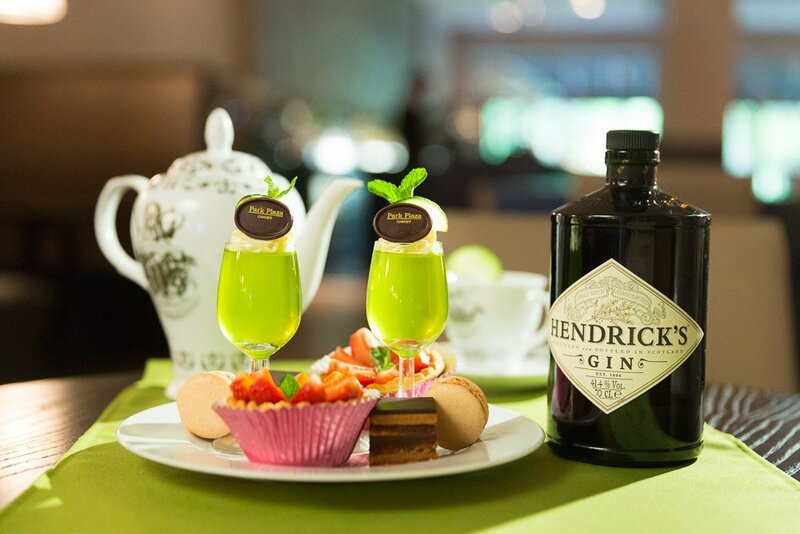 To book an Hendrick’s Gin Afternoon Tea, you can either book online or telephone 02920 111 103. 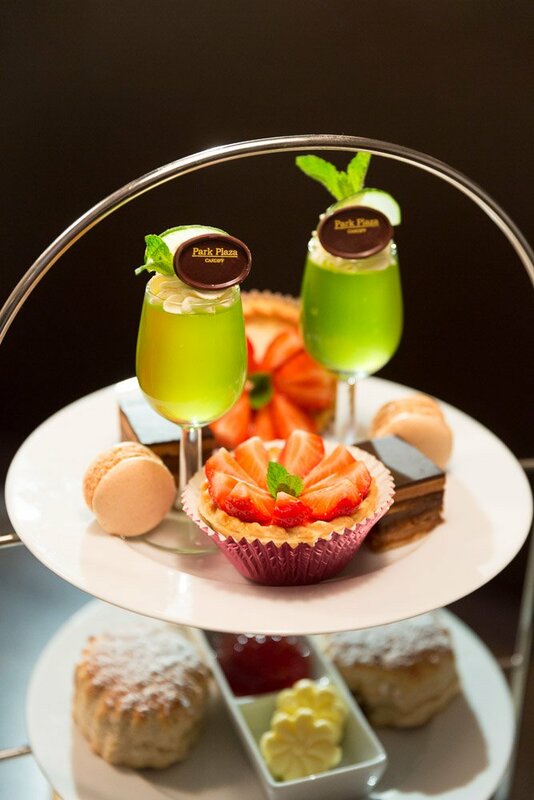 Afternoon teas are served daily in the Laguna Bar from 1.00 pm until 5:30 pm. "Surely I’m Too Young For Aches & Pains?" It was really refreshing and I’d happily do it again. I could do with a spa treatment or two too! I love this afternoon tea, the Hendrick’s Elderflower Collins is really pleasant and summery. Nice to read about the Afternoon Tea origins too! Hi Ed – still enjoying your photographs and explorations!